SUVs don’t come much more dependable—or versatile—than the new Honda CR-V. This durable beauty is famous for its practicality, safety, and value retention, which is why it’s been the vehicle of choice for families all across Inglewood. It also boasts an impressive range of features across the spectrum, offering much more than meets the eye. Check it all out for yourself! The new Honda CR-V has just about everything you could want from a family SUV. Its interior is incredibly spacious, especially for the model’s compact stature, offering almost 76 cubic feet of cargo room with the seats folded down and 40.4 inches of legroom in the rear seats. That means that, whether you’re moving furniture across town or taking the family on a trip to Santa Monica, everyone will fit comfortably. In addition, almost every trim of the CR-V (from the EX up) comes standard with the Honda Sensing Suite, which bundles together safety features ranging from Adaptive Cruise Control to Collision Mitigation Braking. 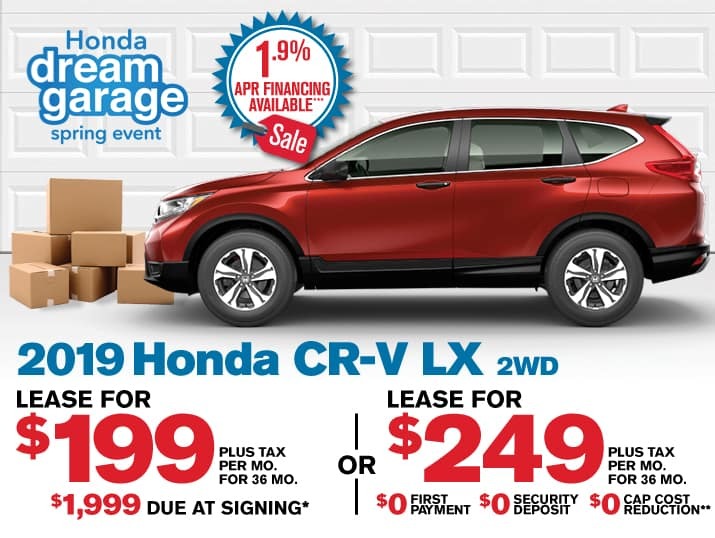 If you want to see just what the new Honda CR-V can do, and how it compares to the Honda HR-V, check out the models we have in stock here at Airport Marina Honda. Our friendly sales staff is ready and waiting to help you find the CR-V you’re looking for, and our flexible financing options make it easy to take one home. So contact us online, and experience the new Honda CR-V for yourself! Airport Marina Honda - Your Helpful Honda Dealer! 2019 Honda CR-V LX Basque Red Pearl II Airport Marina Honda! www.airportmarinahonda.com, Excellent Selection of Used Vehicles, Financing Options, Serving Manhattan Beach, Westchester, Mar Vista, Pacific Palisades, Santa Monica, Playa del Rey, Beverly Hills, Inglewood, Malibu, Venice, Culver City, Brentwood, Westwood, West Hollywood, Bel Air, Ladera Heights and El Segundo but all over Southern California and LA. ALL ADVERTISED PRICES EXCLUDE GOVERNMENT FEES AND TAXES, ANY FINANCE CHARGES, ANY DEALER DOCUMENT PROCESSING CHARGE, ANY ELECTRONIC FILING CHARGE, AND ANY EMISSION TESTING CHARGE”. Airport Marina Honda - Your Helpful Honda Dealer! 2019 Honda CR-V LX Lunar Silver Metallic Airport Marina Honda! www.airportmarinahonda.com, Excellent Selection of Used Vehicles, Financing Options, Serving Manhattan Beach, Westchester, Mar Vista, Pacific Palisades, Santa Monica, Playa del Rey, Beverly Hills, Inglewood, Malibu, Venice, Culver City, Brentwood, Westwood, West Hollywood, Bel Air, Ladera Heights and El Segundo but all over Southern California and LA. ALL ADVERTISED PRICES EXCLUDE GOVERNMENT FEES AND TAXES, ANY FINANCE CHARGES, ANY DEALER DOCUMENT PROCESSING CHARGE, ANY ELECTRONIC FILING CHARGE, AND ANY EMISSION TESTING CHARGE”. Airport Marina Honda - Your Helpful Honda Dealer! 2019 Honda CR-V LX Obsidian Blue Pearl Airport Marina Honda! www.airportmarinahonda.com, Excellent Selection of Used Vehicles, Financing Options, Serving Manhattan Beach, Westchester, Mar Vista, Pacific Palisades, Santa Monica, Playa del Rey, Beverly Hills, Inglewood, Malibu, Venice, Culver City, Brentwood, Westwood, West Hollywood, Bel Air, Ladera Heights and El Segundo but all over Southern California and LA. ALL ADVERTISED PRICES EXCLUDE GOVERNMENT FEES AND TAXES, ANY FINANCE CHARGES, ANY DEALER DOCUMENT PROCESSING CHARGE, ANY ELECTRONIC FILING CHARGE, AND ANY EMISSION TESTING CHARGE”. Airport Marina Honda - Your Helpful Honda Dealer! 2019 Honda CR-V LX Platinum White Pearl Airport Marina Honda! www.airportmarinahonda.com, Excellent Selection of Used Vehicles, Financing Options, Serving Manhattan Beach, Westchester, Mar Vista, Pacific Palisades, Santa Monica, Playa del Rey, Beverly Hills, Inglewood, Malibu, Venice, Culver City, Brentwood, Westwood, West Hollywood, Bel Air, Ladera Heights and El Segundo but all over Southern California and LA. ALL ADVERTISED PRICES EXCLUDE GOVERNMENT FEES AND TAXES, ANY FINANCE CHARGES, ANY DEALER DOCUMENT PROCESSING CHARGE, ANY ELECTRONIC FILING CHARGE, AND ANY EMISSION TESTING CHARGE”. Airport Marina Honda - Your Helpful Honda Dealer! 2019 Honda CR-V LX Airport Marina Honda! www.airportmarinahonda.com, Excellent Selection of Used Vehicles, Financing Options, Serving Manhattan Beach, Westchester, Mar Vista, Pacific Palisades, Santa Monica, Playa del Rey, Beverly Hills, Inglewood, Malibu, Venice, Culver City, Brentwood, Westwood, West Hollywood, Bel Air, Ladera Heights and El Segundo but all over Southern California and LA. ALL ADVERTISED PRICES EXCLUDE GOVERNMENT FEES AND TAXES, ANY FINANCE CHARGES, ANY DEALER DOCUMENT PROCESSING CHARGE, ANY ELECTRONIC FILING CHARGE, AND ANY EMISSION TESTING CHARGE”. Airport Marina Honda - Your Helpful Honda Dealer! 2018 Honda CR-V EX Crystal Black Pearl Airport Marina Honda! www.airportmarinahonda.com, Excellent Selection of Used Vehicles, Financing Options, Serving Manhattan Beach, Westchester, Mar Vista, Pacific Palisades, Santa Monica, Playa del Rey, Beverly Hills, Inglewood, Malibu, Venice, Culver City, Brentwood, Westwood, West Hollywood, Bel Air, Ladera Heights and El Segundo but all over Southern California and LA. ALL ADVERTISED PRICES EXCLUDE GOVERNMENT FEES AND TAXES, ANY FINANCE CHARGES, ANY DEALER DOCUMENT PROCESSING CHARGE, ANY ELECTRONIC FILING CHARGE, AND ANY EMISSION TESTING CHARGE”. Airport Marina Honda - Your Helpful Honda Dealer! 2019 Honda CR-V EX Gunmetal Metallic Airport Marina Honda! www.airportmarinahonda.com, Excellent Selection of Used Vehicles, Financing Options, Serving Manhattan Beach, Westchester, Mar Vista, Pacific Palisades, Santa Monica, Playa del Rey, Beverly Hills, Inglewood, Malibu, Venice, Culver City, Brentwood, Westwood, West Hollywood, Bel Air, Ladera Heights and El Segundo but all over Southern California and LA. ALL ADVERTISED PRICES EXCLUDE GOVERNMENT FEES AND TAXES, ANY FINANCE CHARGES, ANY DEALER DOCUMENT PROCESSING CHARGE, ANY ELECTRONIC FILING CHARGE, AND ANY EMISSION TESTING CHARGE”. Airport Marina Honda - Your Helpful Honda Dealer! 2019 Honda CR-V EX WX Airport Marina Honda! www.airportmarinahonda.com, Excellent Selection of Used Vehicles, Financing Options, Serving Manhattan Beach, Westchester, Mar Vista, Pacific Palisades, Santa Monica, Playa del Rey, Beverly Hills, Inglewood, Malibu, Venice, Culver City, Brentwood, Westwood, West Hollywood, Bel Air, Ladera Heights and El Segundo but all over Southern California and LA. ALL ADVERTISED PRICES EXCLUDE GOVERNMENT FEES AND TAXES, ANY FINANCE CHARGES, ANY DEALER DOCUMENT PROCESSING CHARGE, ANY ELECTRONIC FILING CHARGE, AND ANY EMISSION TESTING CHARGE”. Airport Marina Honda - Your Helpful Honda Dealer! 2019 Honda CR-V EX Lunar Silver Metallic Airport Marina Honda! www.airportmarinahonda.com, Excellent Selection of Used Vehicles, Financing Options, Serving Manhattan Beach, Westchester, Mar Vista, Pacific Palisades, Santa Monica, Playa del Rey, Beverly Hills, Inglewood, Malibu, Venice, Culver City, Brentwood, Westwood, West Hollywood, Bel Air, Ladera Heights and El Segundo but all over Southern California and LA. ALL ADVERTISED PRICES EXCLUDE GOVERNMENT FEES AND TAXES, ANY FINANCE CHARGES, ANY DEALER DOCUMENT PROCESSING CHARGE, ANY ELECTRONIC FILING CHARGE, AND ANY EMISSION TESTING CHARGE”. Airport Marina Honda - Your Helpful Honda Dealer! 2019 Honda CR-V EX Platinum White Pearl Airport Marina Honda! www.airportmarinahonda.com, Excellent Selection of Used Vehicles, Financing Options, Serving Manhattan Beach, Westchester, Mar Vista, Pacific Palisades, Santa Monica, Playa del Rey, Beverly Hills, Inglewood, Malibu, Venice, Culver City, Brentwood, Westwood, West Hollywood, Bel Air, Ladera Heights and El Segundo but all over Southern California and LA. ALL ADVERTISED PRICES EXCLUDE GOVERNMENT FEES AND TAXES, ANY FINANCE CHARGES, ANY DEALER DOCUMENT PROCESSING CHARGE, ANY ELECTRONIC FILING CHARGE, AND ANY EMISSION TESTING CHARGE”. Airport Marina Honda - Your Helpful Honda Dealer! 2019 Honda CR-V EX Crystal Black Pearl Airport Marina Honda! www.airportmarinahonda.com, Excellent Selection of Used Vehicles, Financing Options, Serving Manhattan Beach, Westchester, Mar Vista, Pacific Palisades, Santa Monica, Playa del Rey, Beverly Hills, Inglewood, Malibu, Venice, Culver City, Brentwood, Westwood, West Hollywood, Bel Air, Ladera Heights and El Segundo but all over Southern California and LA. ALL ADVERTISED PRICES EXCLUDE GOVERNMENT FEES AND TAXES, ANY FINANCE CHARGES, ANY DEALER DOCUMENT PROCESSING CHARGE, ANY ELECTRONIC FILING CHARGE, AND ANY EMISSION TESTING CHARGE”. Airport Marina Honda - Your Helpful Honda Dealer! 2019 Honda CR-V EX-L Black Airport Marina Honda! www.airportmarinahonda.com, Excellent Selection of Used Vehicles, Financing Options, Serving Manhattan Beach, Westchester, Mar Vista, Pacific Palisades, Santa Monica, Playa del Rey, Beverly Hills, Inglewood, Malibu, Venice, Culver City, Brentwood, Westwood, West Hollywood, Bel Air, Ladera Heights and El Segundo but all over Southern California and LA. ALL ADVERTISED PRICES EXCLUDE GOVERNMENT FEES AND TAXES, ANY FINANCE CHARGES, ANY DEALER DOCUMENT PROCESSING CHARGE, ANY ELECTRONIC FILING CHARGE, AND ANY EMISSION TESTING CHARGE”.